Tropical Storm Joaquin: New York City and the rest of the East Coast should prepare for a lot of rain. 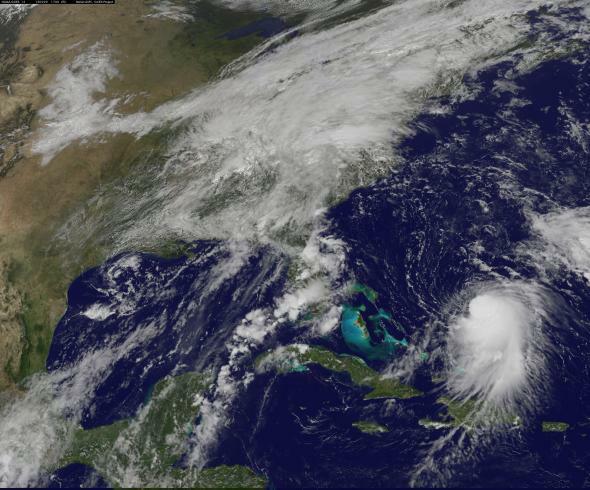 Tropical Storm Joaquin, as seen from space early Tuesday afternoon, is currently nearing the Bahamas. The storm is likely to funnel huge amounts of rainfall toward the East Coast this week. The East Coast is about to get a lot of rain. The latest projection from the National Weather Service’s Weather Prediction Center (below), which is produced by meteorologists after consulting a suite of computer forecast models, shows as much as 8–9 inches of rain is likely from the mid-Atlantic to southern New England through next Tuesday. That’s an incredible amount—more than two months’ worth—and individual weather models are showing even more is possible in some areas if thunderstorms align into narrow bands. A trio of tropical entities plus a sluggish frontal system will produce a deluge this week across the entire Northeast. Here, likely seven-day rainfall totals. Much of this week’s torrential rainfall will come via a “predecessor rain event”—the meteorological term for a plume of tropical moisture that’s funneled inland and concentrated along a front over a wide geographical region in advance of a tropical storm or hurricane. In this case, that storm would be Tropical Storm Joaquin, currently inching its way toward the Bahamas. Weather models still have basically no clue what Joaquin will do over the next several days, but there’s a chance that it, too, could make landfall over the same region that’s being hit by the rain between Tuesday and Friday. If Joaquin makes landfall, it probably won’t arrive until Saturday or Sunday. By then, the ground will be soaked and the risk of flooding would increase. Current weather models suggest Joaquin may be shunted out to sea as the front advances toward the coast after a complex interaction with two other smaller tropical systems, though a few scenarios show a left hook turn back toward the Northeast coastline. In a worst-case scenario, Joaquin could make landfall somewhere between North Carolina and Massachusetts at hurricane strength. Even if Joaquin doesn’t make landfall, this meteorological setup is nearly ideal for a high-impact flood event later this week across the core of the Northeast, from Washington, D.C., to New York City to Boston. Comparing the current pattern with similar historical weather patterns, one of the leading analogues right now is Hurricane Irene in 2011, which produced catastrophic flooding in upstate New York and New England. Other matches include the merging of Tropical Storm Tammy and a subtropical depression in October 2005 and the remnants of Tropical Storm Nicole in 2010. Ocean temperatures in the vicinity of Tropical Storm Joaquin are currently at the warmest levels ever measured since weather records began in 1880—there’s clearly a lot of energy to work with here. One coastal New Jersey resident has already reported seeing workers starting to build up sand berms to protect the beach, and the air in New York City has a tropical feel. My best advice, given the uncertainty: Don’t forget your rain boots.